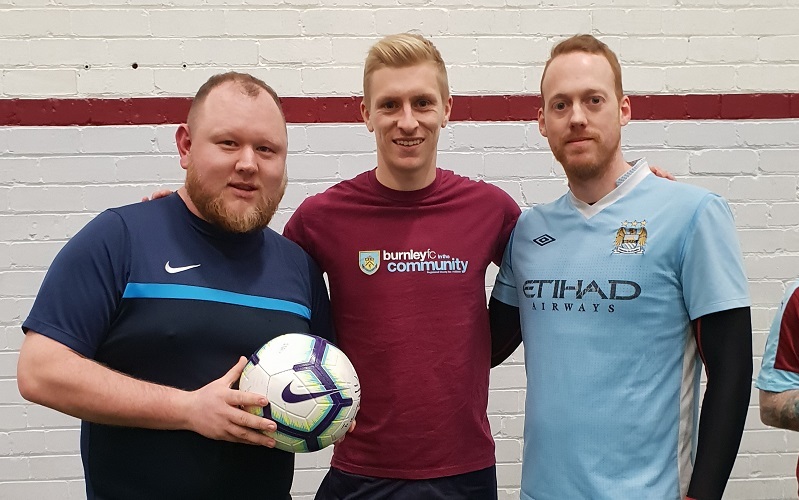 Service users and staff from Cygnet Hospital Bury’s football team recently got to enjoy a private training session with Premier League footballer Ben Mee, captain of Burnley FC. This is the latest development from what started out as a Monday football group set up at the hospital by the occupational therapy team. Over the last year links have been developed with a number of football clubs which have community mental health projects. Highlights have included taking part in a local Social Inclusion Football League and attending a Premier League football match at Burnley in conjunction with Burnley FC in the Community. The links with Burnley FC have developed since then and the Premier League club have begun sponsoring Cygnet Hospital Bury’s football team in the Social Inclusion League. The team have been provided with the full Burnley FC football kit. As a result they have recently changed their team name to ‘Burnley FC INT (In the Community)’. Most recently the team were invited to have a private training session with Burnley FC’s team captain, Ben Mee. Service users supported by Jon and Ben from the hospital’s occupational therapy team had an unforgettable day training with Ben. Afterwards Ben held a Q&A session with the service users, posed for photos and signed autographs. Well done to Ben, Jon and the team at Bury for all their hard work and a huge thanks to Ben Mee and Burnley FC in the Community for all their support.